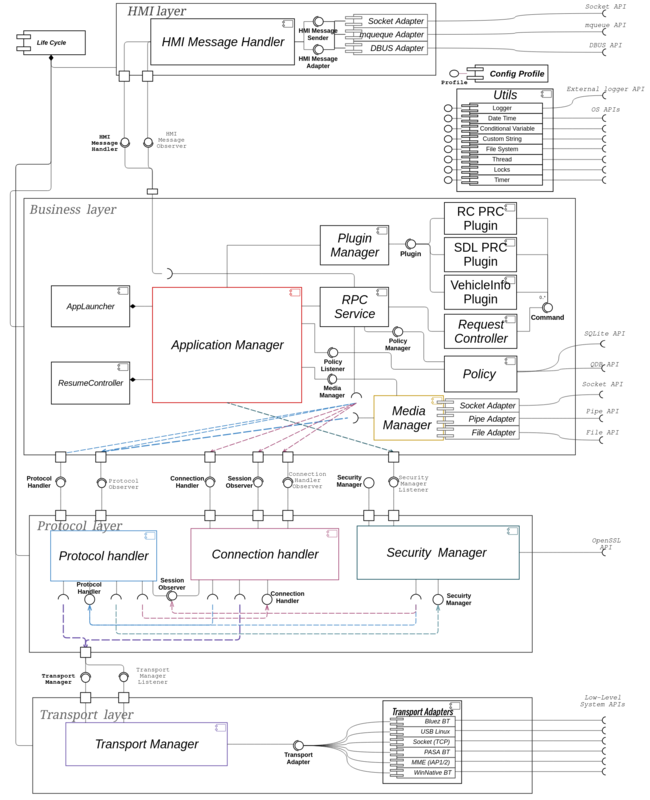 The view is represented by module and subsystem diagrams that show the system's export and import relationships. The Components View diagram and its elements description please see below. Note: UML notation for this Components View diagram is extended: both component and its interfaces are highlighted with the same color. Life Cycle creates all available in system components according to configuration, binds components to components, and starts each component's internal routines. Storing information about application configuration. Config Profile parses configurable data storage and provides primitive types by section and name of configurable value. Configuration format - INI file. Utils behavior relates to system-specific API. Formatting message to and from unified protocol-API-independent format used by higher-level component. Providing adapters for different transport types between SDL and HMI. Transferring RPC Messages between business-layer and configured transport. Processes messages from a single instance of HMI only. HMI-transport need to be statically configurable with build flags. The component implements business logic of the SDL. Mobile Requests are spitted between responsible HMI interfaces and sent as separate HMI Requests or Notifications. HMI Responses and notifications are verified according to business requirements and provided to Mobile. Commands happy paths are depends on correct HMI Behavior implementation. Request Controller handles timeout of responses and notifications from HMI. Configurable count of threads usage. Launch known applications on devices. Use Resume Controller interface to get HMI level of saved application. App Launch launch all known applications on newly connected device. Not work for Android apps. Not work for apps connected via SDL protocol version lower than 4. Loads and manages plugins from specific directory. Resumption backs up application and HMI-related data and restores it after SDL start-up according to business logics. Needs to be a switchable components: dynamically by configuration file and statically by SDL build define. Media Manager transfers raw Audio and Video data through one of the Media-adapters. Allows incorporating additional functionality to the core application by application extension. Implements specific mobile RPC processing. Implements specific HMI RPC processing. Implements regular mobile RPC processing. Implements regular HMI RPC processing. Provides ProtocolObserver notification for subscription on protocol events. Decodes income raw transport data and encodes outcome RPCs according to protocol specification. Connection Handler works as a proxy from business-layer to transport layer and provides additional information related to protocol sessions and services. Security Manager provides methods to establish encrypted connection to mobile. Accumulative class for all available in system devices and connections. Adopts transport searching, connecting, data transferring API for one TransportAdapters interface. For Bluetooth BlueZ transport there are only 30 connections available due to RFCOMM channels limitations.